Make your brand stand out from the crowd. 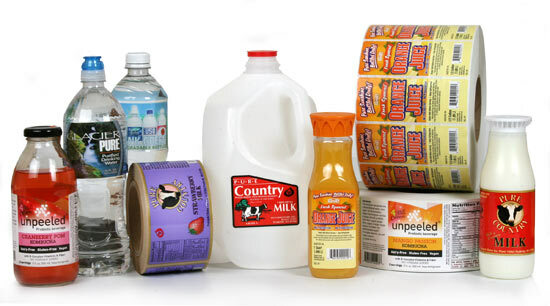 Your label should be able to withstand shipment, grocery storage and home use. Weber offers a wide range of materials that can be placed in ice buckets, freezers, fridges or other wet and humid environments. • Selecting a clear film label for your clear bottle is the perfect way to incorporate your beverage into the packaging design. • Our Graphics team can help select colors and materials that compliment your juice, soda or other drink's color. • Your label should be able to withstand the shipment, grocery storage and home use. Select one of our many materials that can be placed in ice buckets, freezers, fridges or humid environments. • Try a unique shape label rather than a traditional square or rectangle. Pressure-Sensitive labels can be die cut into almost any size or shape your brand needs. • Have a variety of flavors? Want to offer seasonal blends? With Weber's HP Indigo Digital presses we can offer low order minimums perfect for testing new product without holding on to label inventory.